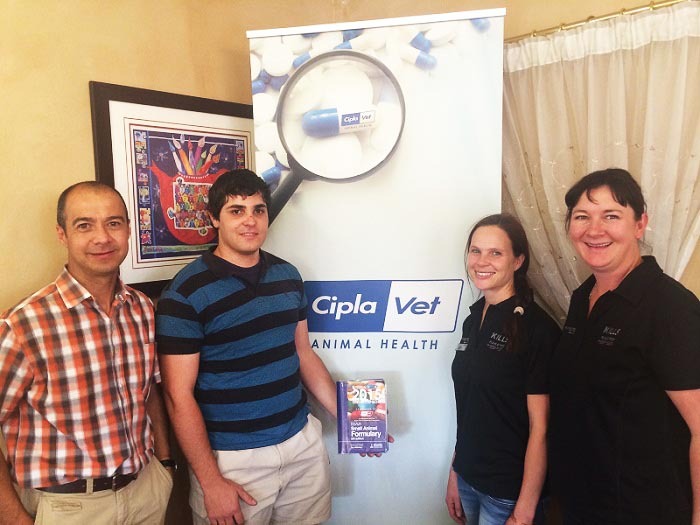 In September 2014 CiplaVet Animal Health (now Ascendis Animal Health), in association with the SA Veterinary Foundation, handed over copies of the BSAVA Small Animal Formulary to each final year clinic group of 4 students. Left to right: Dr Patrick Page, representing the SAVF, and the first student, Mr Wim Janson with a copy of the BSAVA Small Animal Formulary whilst the CiplaVet representatives Ms Debbie Rodgers & Leonore Weiss looks on. Afterwards students were treated to a braai and drinks to interact with CiplaVet staff. It is hoped that these books will assist the students in their clinic year as well as making them more aware of the Foundation and its functions and mandate. The books were bought from a book fund specially set up by the SAVF for the purpose to assist students in their academic life. This is in addition to the bursaries that the Foundation gives to students.